So the SP500 and Nikkie consolidate. The structure is still very much intact. Baring a shock to the system, the markets may have a bit more potential down side, but they may seem ready to continue the push higher. Of course this assumes the US markets decouple from Japan or the BoJ continues it's $1.4trillion stimulus. (Bank of Japan promise of $1.4 in two years.) Guessing the declines in the Yen are 'tells' to when the bank acts. It's about the same level to which the huge stimulus was announced. Japan's inflation target is 2%. 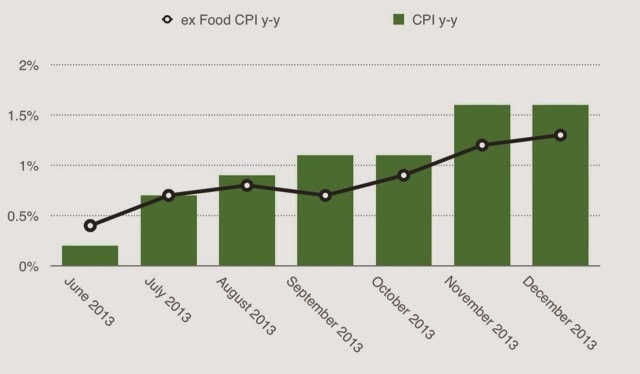 After last weeks inflation report, the BoJ has room to maneuver.